TRELOCK is one of Germany’s oldest and best known bicycle accessory brands. The company was founded in Münster in 1854; meaning they have been developing bicycle security systems (and frustrating thieves) for over 150 years! TRELOCK also focuses on safe night and low-light riding – producing quality lights and lamps for every rider. Their products are characterised by sophisticated design, innovative technology and high standards. 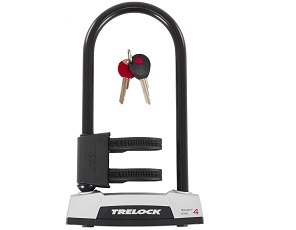 Trelock manufactures products that make you feel secure and confident while on the road, as well as when you lock up your bike and leave it behind. For over the past 150 years, Trelock has developed technologically-advanced innovations, reliable and high-quality security systems, bike locks, lights and bicycle computers, and it continues to push the boundaries with new technical solutions to make its products safer, more durable and user friendly. German brand Trelock, is one of the oldest producers of bike accessories on the market. The company began in 1854 in Münster – the “bike capital” of Germany - and since then has designed, innovated and manufactured products including bicycle locks, bicycle lights and more recently, bicycle computers. Used every day by everyday cyclists and professionals throughout the world, Trelock always places the focus on the customer first when developing new products and continuously strives to find new technical solutions that make its products even more durable, easier to use and, above all, benefit the cyclist that is using them. While the company is best known for its range of bike locks, they now also have a comprehensive selection of high-tech bike computers and energy-efficient bike lights, among other accessories. On the Bikester.co.uk website, there is a large collection of Trelock bike locks that fall into different categories and offer the appropriate level of security for every situation, depending on the requirements of every cyclist. Trelock chain locks are made from optimised Tredur steel, a very strong and robust steel that is extremely difficult to saw or cut through, giving you extra security when leaving the bike unattended. The chain locks are covered in a tough outer fabric, which always features an attractive design and comes with an automatic locking mechanism, corrosion protection and reversible key – so no matter which way you put the key in, you can open the lock – which is especially useful in bad lighting or adverse weather conditions. Trelock has also developed easy-to-handle folding bicycle locks that are easy to carry and take up very little space, while still featuring Trelock’s trademark technologies such as the Armadon 360° attack protection, automatic locking mechanism, corrosion protection and reversible key – so no matter which way you put the key in, you can open the lock – which is especially useful in bad lighting or adverse weather conditions. Lightweight U locks (or D locks) are integrated with optimised Tredur steel technology and Armadon 360° attack protection, automatic locking mechanism, corrosion protection and reversible key to offer the highest level of security and are recommended to secure more expensive bikes. Frame locks that are ideal for providing additional protection to cable or chain locks to ensure a completely secure anti-theft system. Furthermore, you will find a comprehensive range of rechargeable Trelock bike lights integrated with bicycle charging jacks, reflectors and accessories that not only ensure you can see and be seen while on the road but are energy efficient too.